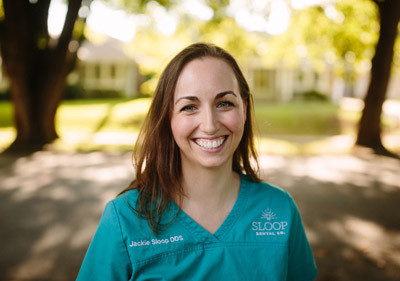 Brookside Kansas City Dental Office | Sloop Dental Co.
Dr. Sloop received a bachelor’s degree in Business Management from the University of Kansas and a DDS from the University of Missouri-Kansas City. As an artist, Dr. Sloop decided to combine her love of art and using her hands with her interest in science to become a dentist. She lives with her husband, two young sons, and three dogs in Brookside and enjoys supporting the local community. 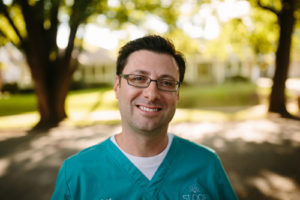 Connect with Dr. Sloop on LinkedIn. 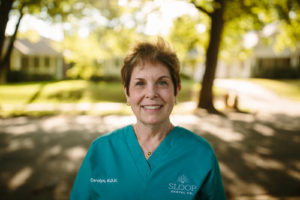 Carolyn Stenquist is a Dental Hygienist at Sloop Dental Co. She is a native of the Brookside area, proudly graduating from Southwest High School and the University of Missouri-Kansas City School of Dentistry. Carolyn is married to Dr. Glenn Stenquist, who was a dentist and prosthodontist in the U.S. Air Force. They had a private practice in California, Missouri for 17 years where they spent time riding horses with the Moniteau Saddle Club. After selling their practice they happily moved back to Brookside where Carolyn is glad to be living and working again. 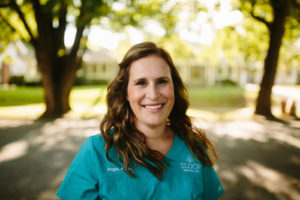 Angie Dinkel is a Dental Hygienist for Sloop Dental Co. and has been actively practicing for over 14 years in Kansas City. She was born and raised in Topeka, Kansas and moved to Kansas City to attend college on a basketball scholarship. After completing her basketball career as a national champion, she went on to graduate from Johnson County Community College’s dental hygiene program in 2002. Angie married her longtime love, Shane, in September 2016 and they live in downtown KC along with their 95-pound yellow lab, Clyde. Angie enjoys traveling, reading, taking Clyde for long walks around the city, playing volleyball, and watching a multitude of sports but, her heart belongs to the Jayhawks (Rock Chalk!). Brad Hutchcraft is a Dental Assistant for Sloop Dental Co. He has formal assistant training and schooling at Concorde Career College and has been in dentistry for five years. Brad prides himself on being knowledgeable and helpful to his patients. Originally from St. Joe, Brad has been living in the Kansas City area for 15 years. Brad enjoys traveling and spending time with his two dogs, Molly and Baily. He also likes to barbecue with family and friends.